If you were offered $10,000 dollars to make someone ‘disappear’, what would you do? Jesse Hardner is nineteen years old and working as a milk man to support himself through college. Since an accident which killed his father and injured his mother, Jesse has also taken on the role of carer. He has far less time than he’d like to shoot hoops with his friends, develop his relationship with the girl he’s fallen for, and get his old Firebird back on the road. As if life wasn’t hard enough without his mentor and role model. Gradually, with his mother on the long road to recovery, life seems to be improving. That is until the day he witnesses a domestic incident at the home of one of his customers and finds himself dragged unwillingly into their problems. Things reach an alarming peak when he discovers a note addressed to him in the family’s milk box. Selected without his consent, Jesse faces the daunting task of ridding the community of a violent drug dealer, along with all of his baggage. If he is not careful, Jesse could lose everything he loves and has rebuilt. I commute to work via public transit. One day while I was walking to the bus stop I witnessed a milk man almost run over a coyote in his truck. He came to a screeching halt with the coyote standing still in his glaring headlights. Managing to stop in time he stepped out to the delivery door landing and watched the coyote run down a dark street under the street lights. At that time I wondered about a milk mans day on the job. Some are derivatives of my friends over the years, others are characters I have met at various places. It’s 2:30 am and Jesse’s alarm clock just started buzzing. He was not one for hitting snooze, he always figured you should just set your alarm for when you want to get up; there is no point in that half-sleep called snoozing. As with every morning, his clothes were all laid out on the chair next to his bed and his brand new Merrell shoes that his mom gave him for graduating high school were sitting under the chair, a layer of talcum powder inside both. He doesn’t shower before his job; that waits until it’s time to get ready for the local community college courses he signed up for last spring. It takes him less than ten minutes to get out the front door into the dark frosty morning. This frozen morning there is a full moon, with a light hazy fog rolling around. Grateful that the projected couple inches of snow did not fall this morning, the moonlight means he is able to ride his bike the short two miles to work, instead of walking. The streets get too slick for a bike with skinny tires on snowy mornings. The derailleur on his Schwinn was broken and it was stuck in seventh gear, so it was always tough to start off quickly, but once you got some speed developed, it was just right. The initial launch from his driveway was downhill and the road in front of the house continued downhill to the stop sign where he had to turn, so it was relatively easy to build up the necessary speed. When he came to the end of the first block, near the stop sign, he heard tires screeching, and a powerful motor spinning them. Jesse was next to the sidewalk as he rounded the corner. He stopped by putting his foot down on the curb to turn west when, out of the blue about forty yards away was a stingray Corvette with no headlights coming right for him. The driver saw him at the last second and veered to the right, missing Jesse by a foot. The killing machine did a couple of corrective veers to get back into the right lane and then its headlights snapped on and the driver spun the car sideways to a stop and fixed the lights on Jesse. There was female laughter and music coming from the car but Jesse could not see anything due to the bright lights shining in his eyes. Hearing some cussing, he stepped off his bike and moved to the side so he could see better and try to determine what was happening. The driver opened his door, reached behind his seat and pulled out what looked to be a golf club. There was a blonde lady sitting in the passenger seat, not really paying attention to what the driver was doing. She was laughing and looking at the radio as if she was tuning to a station. “I am so sick of you damn bicyclists thinking you own the road!” the driver half yelled and half slurred as he started walking towards Jesse with the golf club raised like a baseball bat. His movements were not very coordinated and his walking was more of a shuffle, with some side-stepping. Through the glow of the headlights Jesse could see the man had extremely red-rimmed eyes. It took a minute for the man to shuffle across the one lane of road. When he thought he was in range, he took a feeble swing at Jesse, who took a step backwards. The club missed by two feet. Starting for Jesse again, the driver must not have seen the curb Jesse was standing on and he hit it with his toe. Stumbling over the curb, he fell face-first into the grass on the far side of the sidewalk. Amazingly, this drunk kept hold of the golf club and, while he was still lying on the ground and cussing, swung it at Jesse’s ankles. Jesse was smart enough to see what was coming and jumped out of the way. The driver had now torn his jacket and scuffed his cheek and was rolling to one side so he could get back on his feet. It was a slow process, which Jesse would have found funny if the guy wasn’t trying to hit him with the golf club. At one point, the man had to drop the club in order to go from all fours to standing up. Jesse reached down calmly, picked up the golf club and whipped it across the street into a nearby yard. The driver was now standing up, swaying and looking confusedly at Jesse, as if he had run out of words to say. Behind the drunk, he saw the blonde lady, who seemed to have taken a sudden interest, came running up to join them. She was wearing high heels, a very short skirt, and an overabundance of make-up. Her lips were ruby-red and she had a white powder around her nostrils. She was sniffing a lot and rubbing her nose. The pair made their way slowly back to the Corvette, which was still sitting in the middle of the road, facing the wrong direction. The lady nudged the man hard into the passenger seat and he fell in like a bag of rocks. She tried to slam the door shut but his foot was still hanging out and there was a loud thud followed by, “Ouch, dammit!” The lady knelt down, picked up his foot to move it inside the car and slammed the door shut with success this time. She walked around the car to the driver’s side, giving Jesse a cool straight-on stare while the drunk looked at him with a stupid grin, showing him both of his middle fingers through the windshield. The new driver yelled, “Watch where you’re going, kid!” then yanked the wheel to the right and gunned the Corvette, speeding off in a cloud of screeching rubber. It was rather impressive the way the lady handled the car. Jesse just shook his head, picked up his bike and continued on his ride to work but now he had to get back up to speed on a level surface. He was turning nineteen in a few months and was in shape from the high school athletics track team, and playing football, so it wasn’t too difficult getting the Schwinn back up to speed. 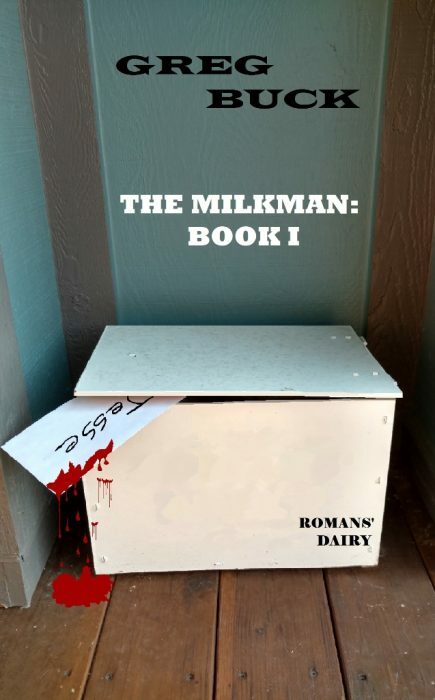 He pulled into the gravel lot at Romans’ Dairy, where all the trucks were parked and saw that his boss, Mr. Roman, had started his truck to warm up the engine as well as the cab. Jesse also noticed that all of the other delivery drivers had already departed for their routes. Mr. Roman was a friend of the family and had known Jesse’s father well before he passed away two years ago. Mr. Roman’s first name was Jerry but Jesse had known him since he could remember and ‘Mr. Roman’ is how he always addressed this family friend. Jesse spied Mr. Roman through the office window, at the front of the farm house. He was sitting at the only desk in the room, from which he managed one of the last local and small dairy farms in a relatively urban location just north of Golden, Colorado. It resembled Einstein’s desk and Jesse was never sure how Mr. Roman could so quickly find what he was looking for on that desk. The farm had both cows and goats and sold a variety of products including cheeses, pies, and, of course, bottled milk. There was also a huge fenced-off section of the property next to the gravel driveway, which was full of chickens and coops. Fresh free range eggs were one of Roman’s best sellers. Frances Roman, Jerry’s wife, who insisted on everyone calling her Fran, would do the baking. She also bought fruits in large quantities; oranges, lemons and grapefruits. Using a machine, she would fresh-squeeze them into bottles, with nothing added and this juice was another top-seller. During the summer months, Fran would sometimes make a cherry limeade with fresh limes, a little water and some freshly mashed cherries. “Good morning, Jesse! I’ve got your truck loaded and warmed up. She’ll need some gas, though; just put it on our account.” Mr. Roman regularly helped Jesse out with the loading, knowing the boy was pulling long days between work and school. Jesse turned and walked back to his truck, slid open the door on the passenger side and, using the stair, he stepped up into the cab. The route was the same every day but the orders changed. Even with the order cards that were placed in their milk boxes each week, along with their current order, customers would call in and change or add an item, or cancel an order altogether. Jesse found that morning’s order lists on the dashboard, attached to a clipboard. He put the truck in gear and dropped the emergency brake then he was off on his route. He had a four- mile drive first, before he started his route. He always drove out to the furthest customer and worked his way back; besides which, the gas station was at the farthest-east point of his route. Jesse had started working for Mr. Roman over four years ago, before he was able to drive. He would help Mr. Roman gather the eggs, load the trucks, and with the general cleaning around the shop. He had become a dependable and loyal employee. When Jesse was seventeen, Mr. Roman asked him if we would like to drive a truck route and Jesse immediately accepted. He had always wanted to drive one of the big brown trucks with ‘Romans’ Dairy’ written in big white letters on the side. As he pulled up to the gas station, he noticed there were no other cars at the pumps so he knew he was going to have to hear an earful from Linda, the store clerk, who seemed to be in need of constant chatter. Sometimes he wondered if she continued to speak even if no one was in the store. At this point Jesse’s mind drifted off. He was thinking about Raven and the last time they were together, on New Year’s Eve. That was almost six weeks ago, and her birthday was coming up. What a wonderful night they had and he was thinking he needed to call her but was it too soon? Would he look desperate if he called now? Jesse had never considered himself a Casanova and was generally very shy around women. Raven was the only woman he had ever dated or even kissed. The first time he asked her to join him for some coffee in the high school cafeteria was the scariest thing he had ever done. Jesse would never forget how hard his heart was pounding and he did not want to botch this relationship. He felt that this one could be special. After working his way out of Linda’s grasp, Jesse set to filling the fuel tank and getting his orders ready, comparing them to Mr. Roman’s order list. From here, he would work his way back towards the dairy and home; heading up one street, turning the corner and going down the next street within his grid. It was an uneventful morning, stopping the truck, putting it in park, checking orders, placing them in customers’ milk boxes, leaving a new order form and then moving on to the next house. Twice, he had to stop and use his flashlight to find a new customer’s address. This always took a little more time in the dark, as some homes didn’t display their addresses in an obvious spot. He saw and waved to the usual early birds and joggers. As he was nearing the end of his route, he drove by his own home and noticed the lights were still off. A little unusual, but not completely, so he kept on going and decided to finish his route. He got back to Romans’ Dairy at around 9:00 am. Fran was in the chicken pen with her granddaughter, Gabrielle, feeding the chickens. She had put together a care package for Jesse, like she did every morning, and had left it sitting in the shade next to his bike. He waved to her. Jesse straddled his bike, put the care package under his arm, and started his ride home. He pulled into his driveway, hopped off the bike and put it back behind the evergreen bush, the care basket still under his arm. Climbing the stairs to the front porch, carrying the care basket, he heard Drew Carey’s voice bellowing out to the next contestant on The Price is Right that they got to play the game Hole in One (Or Two). A smile formed on Jesse’s face as he realized his mother would be sitting in her wheel chair in front of the television, watching game shows; her favorite pastime. “That boy is not right in the head. He needs a rubber room.” John Rodney had graduated with Jesse and played linebacker on the same football team that Jesse played quarterback. Two months earlier, while Jesse was making his deliveries, John was caught by the police running down the street in his underwear, waving a Denver Broncos flag and yelling unintelligibly. He was no doubt drunk and following in his father’s footsteps. But John and Jesse had been friends since grade school. Jesse walked into the kitchen and removed the towel from the top of the care basket, revealing fresh grapefruit juice, four eggs, and two homemade biscuits. Jesse started busying himself in the kitchen. Fran’s baskets, and Jesse cooking brunch, had been a ritual since his mother was released from the hospital after the accident. A little less than two years ago, Becky and Aaron Hardner were driving home from the IMAX Theater at Colorado Mills Mall in Lakewood, CO. They had gone to see Star Wars: The Force Awakens. Jesse’s father, Aaron, had grown up with the Star Wars film series and was a big fan although; he didn’t go as far as buying the merchandise or dressing up like the characters. He just loved to watch the movies on the big screen. Becky went along, just to get out of the house, and Aaron had promised dinner at Jose O’Shea’s; an above-average Tex-Mex restaurant with a great atmosphere, not far from the theater. They decided to go out for food first and then to the movie, so they wouldn’t fill up on popcorn. Aaron said he was famished and ordered the combo fajitas plate and Becky had her favorite, Chile Rellenos with hot green chili and a side of sour cream. They had an enjoyable dinner and headed to the theater for the 7:30 pm show. Aaron really liked the movie and kept talking about it on their way out of the theater and through the parking lot. It was really cold and Aaron opened the door for Becky then started the car to get the heat going. He grabbed the ice scraper to clear away the inch of snow and ice that had dusted the area since they arrived. Back in the car, he put his gloveless hands up by the window defroster, continuing to talk about how much he enjoyed that movie and how it was so much better than the last two Star Wars movies. They sat there for about five minutes until the windows defrosted and Aaron could feel his hands. Becky just sat in her seat, all bundled up, listening to Aaron and smiling. Putting the Ford Focus into reverse, Aaron waited for two couples to pass by then backed out of the busy parking space. He continued toward the exit and decided to get on the highway. This was a much shorter and easier drive than going through all of the lights and stop signs that were congested with other movie and shopping patrons. The highway seemed to be flowing at a decent speed, even with the snow and ice, and they were soon heading east on I-70. The highway was moving along at about 45 mph, everyone was paying heed to the weather conditions, and there were no aggressive drivers about in their vicinity. Even, so Aaron became quiet. Becky could tell he was a little nervous and knew he was white-knuckling; both hands on the steering wheel, his full focus forward. She reached down to grab her water bottle and offer some to Aaron and that’s when she heard the scream that would haunt her until her time was up. There was a slight lifting of the car and it felt like gravity was switched off. Everything went into slow motion. Lights… then dark… lights… dark… then a sudden, shocking thud that jarred her head and slammed her teeth into something hard. A scraping noise began with sparks and snow flying all around, and she felt like she was dangling over a mass of fire and ice. She tried to turn her head to see Aaron, but she couldn’t and then the darkness was taking over as she heard screaming and people yelling. They seemed to be getting closer. Aaron was a construction foreman for a house-building crew and Becky always feared for his life on the jobsite, with all the heavy equipment and nail guns. She never thought about an accident happening to her Aaron offsite. He was such a big, strong man, with a booming voice. Her rock. She slowly woke up in the hospital, unaware of the time. Why was she there, and what was with all the needles, tubes, machines and beeping noises? She tried to look around but something was holding her still and she couldn’t turn her head. She tried to rise up on her elbows but she couldn’t move her arms. Everything felt restrained. Now panic was setting in and the beeping noises became louder and faster, then she heard someone say “Mom” and into the field of her vision came the loveliest face; her boy, Jesse. The beeping slowed a bit as the nurses came barging in with concerned looks on their faces, which soon relaxed when the scene came into focus. “Welcome back, Mrs. Hardner. I’m just going to check your vitals and the machines quickly, then I will be leaving,” said a nurse. Jesse stepped back for a minute, staying in his mom’s vision as they locked eyes while the nurses did their thing. He started with a slow, loving smile, holding back the tears the best he could. Becky also had a loving smile on her face but Jesse could see it turning into a concerned frown and fright at the sight of the tears running down his cheeks.